Today I have a couple of cards to share with you using a new to me product called Glass Bead Glitter Gel by Faber Castell. The StampNation Dream Team was lucky enough to get a huge box of amazing goodies from Faber Castell and the Glass Bead Glitter Gel was one of the products in my box. It is so fun to work with and adds some amazing shine to your projects. Thank you SO much Faber Castell! For this card I used the Glass Bead Glitter Gel, spread it over my stencil, then applied some Ultramarine Blue Color Burst over the whole thing. I then spritzed with water to get the color bursts moving and blending. I have to give credit to the amazing Ingrid for this fun technique. She shared a video recently over on StampNation and I knew I had to try it out. Thanks, Ingrid! 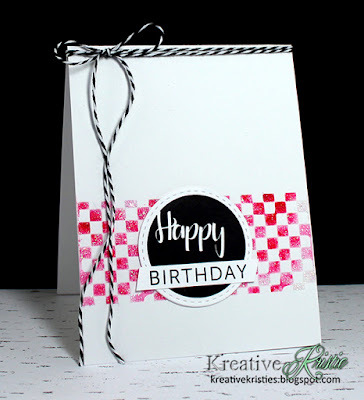 This card uses the same technique, but masked off the stenciled portion so it is a one layer card with the sentiment popped up. I used Alizarin Crimson Color Burst powder on this one. The sentiment stamps are from the Spot On stamp set in the Foundations Box by Catherine Pooler. I used Lil' Inkers stitched circle dies to cut out the happy sentiment. I am adding these over at Seize the Birthday: Anything goes. Wow Kristie! These cards are gorgeous and soooooo cool! I've never heard of this product before, so thanks for the info! 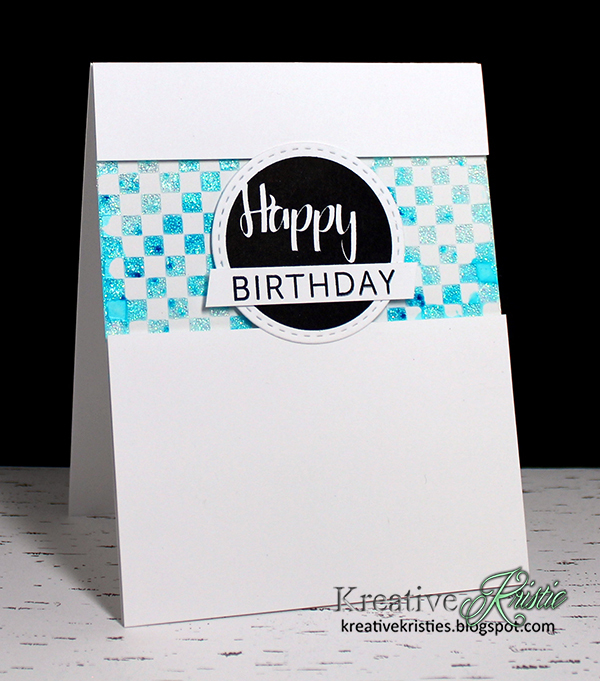 No surprise that I'm loving this clean and graphic design that let's the cool Happy Birthday stamp shine! Beautiful cards Kristie. Love the technique you used. Thanks for sharing with us at Seize the Birthday. Glass bead shimmer gel? Now that sounds like fun! So many new products out there I have never heard of. You made wonderful use of it Kristie, such gorgeous cards. 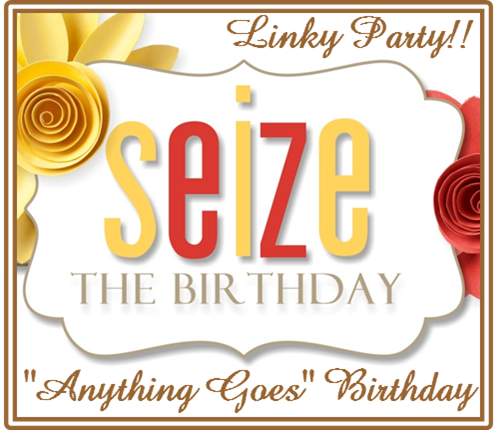 Thanks so much for sharing with us at Seize the Birthday! Your cards are gorgeous Kristie! I like the sound of that glass bead shimmer gel! What a great gift and it looks so fabulous on your cards too! What a lucky gal you are! Thanks so very much for being in our gallery at Seize the Birthday! Sounds and looks like fun stuff, especially with the word 'glitter' in it, you know we all love a bit of that! What great examples!